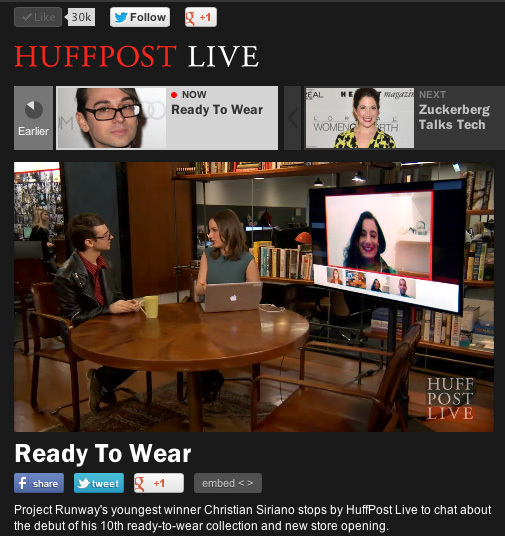 Because I am too freaking exhausted to write anything coherent tonight, here is a screen grab of my Huffpost Live segment, shot today with Christian Siriano of Project Runway fame. I will fill you in on all the deets tomorrow, as well as some tidbits from a chance encounter with Tommy Hilfiger today. Two very different success stories, from two very different men, who both found a unique way to pursue their dreams.Inspiration doesn’t get much better than this! WIth all of this talk about food, and leftovers, I thought it was time to talk about fashion again. Here is an article previously posted on Fashionista Cafe, a website that I am a contributor for. 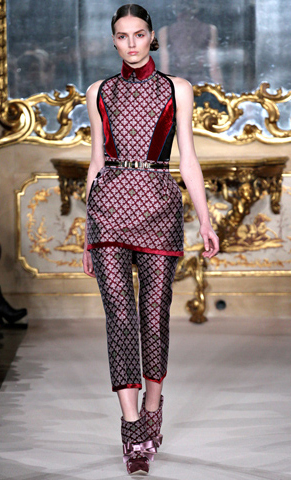 Milan Fashion Week offered a beautiful take on old world opulence with a decidedly modern flair. Textiles and embellishments played a big role in fashion this season, and time-honored techniques such as gold embroidery and beading enhanced the rich, luxe fabrics and couture-like cuts that roamed the catwalks. Dolce and Gabbana are some of the most prolific designers in the world, taking an idea and turning out multiple iterations that never fail to impress. 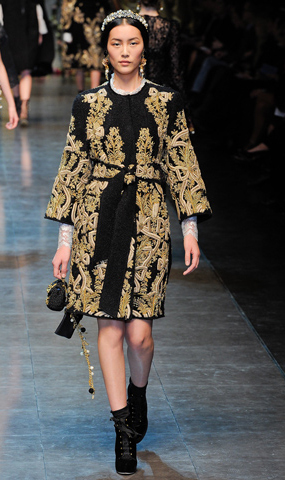 This season, they took their inspiration from Sicilian baroque traditions. Lavishly embroidered frocks and capes, reminiscent of religious vestments were worked against lace and figurative needlepoint florals replete with images of cherubs, in some of the duo’s signature silhouettes. Aquilano Rimondi also took their inspiration from the church, religious jewelry and the richness of Renaissance paintings. Their modern twist on opulence ranged from masculine to feminine silhouettes, in an array of deeply colored jacquards and luxurious velvets. Miuccia Prada took a more modern approach to her collection, using chunky jewels to embellish the strict, elongated shapes she showed. 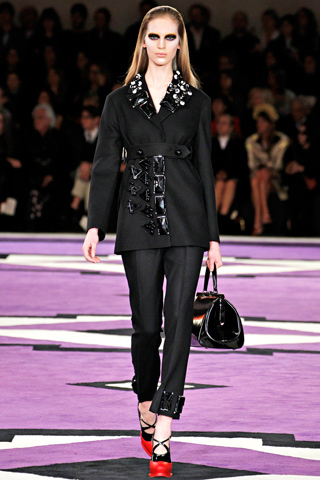 The mostly black ensembles were shown in strong contrast to the bold geometric prints reminiscent of David Hicks that were also part of the offering. Consuelo Castiglioni stayed true to Marni’s roots, showing a clean, modern assortment that spanned the range from spare to opulent via her play on textiles and ornamentation. Whether it was her Bauhaus inspired separates in a unique color palette of camel, red, winter white and duck egg blue or her rich jacquards and jeweled pieces in black and gold, an architectural influence prevailed. Antonio Marras is a master at his craft, and this season was no exception. Marras mixed velvet, tapestry, menswear fabrics and fur into 40’s inspired silhouettes for a feminine and artistic take on the season. His keen attention to workmanship and details made this collection one to watch. 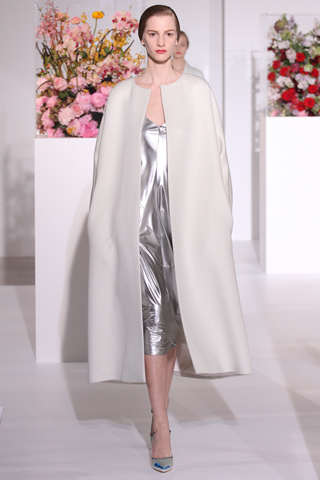 Raf Simons bid adieu to Jil Sander with a ladylike collection with a couture-like edge. Simons vision of a woman in shades of winter white, toast, soft blue and pale pink were shown in oversized coats, which the models clutched modestly, over slip-like dresses in charmuese. Unexpected pops of rich red, and a shot of metallic silver added an air of modernity. It was an outstanding finale to a brilliant career at Jil Sander, soliciting a standing ovation from the audience. The Milanese designers provided covetable clothing that stirs us emotionally and inspires us creatively. All in all, it was the stand out city among the fashion capitals this season. I always credit Barbie for having a profound influence on my life. She sparked my interest in fashion, and was the muse for my earliest designs. This month, some of the world’s most significant designers have come together to dress Barbie and her longtime beau Ken, for a very worthy cause. The fashionista dolls, as well as illustrations from many of the designers, were commissioned to celebrate the 10-year anniversary of Jeffrey, the upscale fashion emporium in New York City’s Meatpacking District. All of the dolls are available for purchase via a silent auction. Proceeds will be donated to benefit AIDS and breast cancer related charities. Check out the exhibit on display in the store, until September 17th.